Don’t settle for less! Buy the Best Waffle Maker you can find! Waffles have been around for hundreds of years, and for folks in America, it’s a popular breakfast item. When it comes to brunches, you can’t have a good one if there aren’t any warm, freshly baked waffles on the table! Then there are people who think waffles are just too yummy to be relegated to brunches. Well enough of that! Are the best waffles only in restaurants? Most just walk into a restaurant and order a few waffles thinking that making delicious, perfectly textures waffles at home is just too difficult. But, did it ever occur to you that you can make your own waffles at home with a waffle maker and customize them to your heart’s content? Yes, you can do all of that at a much lower price than what you would pay at the restaurant. If you’re considering on purchasing a waffle maker, you don’t necessarily have to buy the best waffle maker on the market to bake nice waffles. There are waffle makers that churn out fluffy Belgian waffles to thin, crispy waffles too and heart-shaped waffles. Today’s waffle makers come in an array of designs and special features. So, buy a waffle maker that meets your requirements, is easy to use, clean, and store, and most importantly, easy on your wallet! Below are three of the best waffle makers available on Amazon. They all have great customer reviews and are all high quality kitchen appliances. Let’s take a look at each of them. The All-Clad 99012GT Stainless Steel Classic Round Waffle Maker is an elegant, quality waffle maker from the legendary appliance manufacturer All-Clad. The All-Clad makes waffles that measure at 6.5 inches in diameter and 1/2-inch in thickness. The waffles have four easy-cut sections, so sharing a waffle with four people won’t be a problem. The waffles also have deep pockets, which are excellent for holding melted butter, maple syrup, whipped cream, fruits, and other toppings. 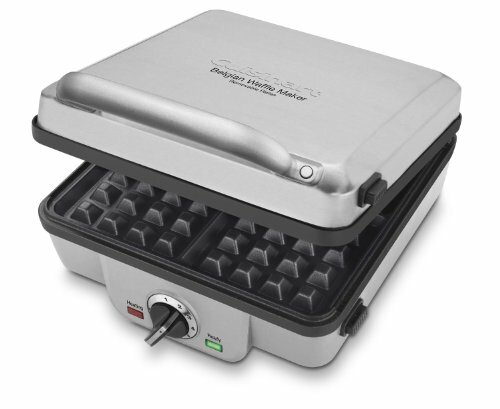 The All-Clad Waffle Maker has seven browning level settings. This waffle maker comes with modern heating technology for consistent baking and browning. The All-Clad is also equipped with a steam-release system that prevents condensation or water vapor from accumulating inside the waffle iron. This feature is really useful as it ensures that the baked waffles have a nice crispy, golden texture and soft on the inside. Another feature of the All-Clad is the beeper with a green light indicator, which alerts the user when the waffle maker is ready for cooking and when the waffles are done. The waffle plates are non-stick making it easier to remove the cooked waffles. It also makes cleaning the waffles plates easier. Now, let’s talk about the build quality of this high-end waffle maker. The All-Clad Waffle Maker looks elegant from the outside. The casing has a polished stainless steel finish with a stainless steel handle that exudes quality. The cord can easily be tucked underneath the unit for convenient storage on kitchen cabinets or countertops. Overall, the construction of the All-Clad also makes it one of the most durable, best waffle makers on the market. 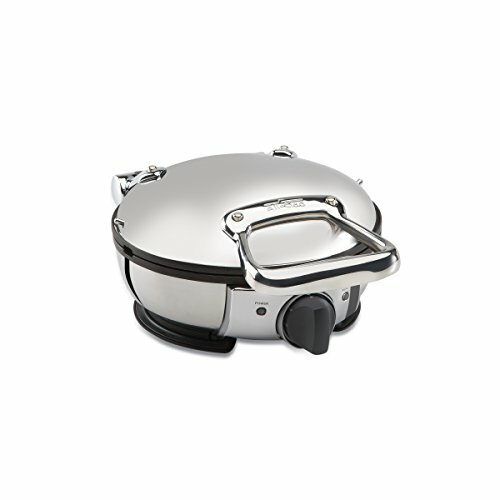 The All-Clad 99012GT Stainless Steel Classic Round Waffle Maker has 4.3/5 stars based on over 270 customer reviews. If you prefer your Belgian waffles to be fluffy on the inside and perfectly brown, crispy on the outside then the Cuisinart 4-Slice Belgian Waffle Maker is one you should be buying. The Cuisinart is designed to bake 1-inch-deep Belgian waffles that can be sliced into four pieces. The deep-pocket waffles are excellent if you like to garnish your waffles with fruits, maple syrup, whipped cream and other kinds of toppings. You can customize the brownness of the waffles with the included Five-setting browning control feature. This ensures that the waffles are baked cooked exactly how you like them. The Cuisinart Belgian Waffle Maker is a high-performance waffle iron that is easy to use and setup. The lid at the top has a locking mechanism, and the cord wraps under the base of the unit, which is great for compact storage. Cleaning the Cuisinart after baking is also easy as the waffle plates are non-stick. The non-stick coating of the waffle plates also makes removing the cooked waffles with a fork or thong easily. There is a green indicator light that illuminates when the waffle maker is hot and ready to bake, and when the waffles are cooked. The exterior of the waffle maker looks great with the top cover made of stainless steel with embossed logo and chrome-plated handle. The Cuisinart Belgian Waffle Maker is 4.7-inches in height and 10-inches in width and weighs only 9.6 pounds, which makes it very compact when compared to other waffles makers. The Cuisinart 4-Slice Belgian Waffle Maker has 4.3/5 stars based on over 300 customer reviews. When it comes to the smartest, fanciest, smartest, and finely-tuned best waffle maker on the market, Breville’s The Smart 4-Slice Waffle Maker is hands down the king. This waffle maker isn’t only pretty; also does best what it was made for—bake awesome waffles. From the outside, the Breville looks super slick with the brushed stainless steel exterior. The waffle plates are aluminum-made and coated with a non-stick coating. The waffles can be removed from the plates very easily leaving little to no residue. The waffle plates cannot be removed, but they’re easy to clean. There is a decently sized LED display that shows the various waffle-baking options. The LED screen also changes colors to indicate when the waffle iron is ready for baking and when the waffles are done. There are audible beeps that do the same thing. The knobs allow users to select specific waffle styles as well as to adjust the lightness and darkness of the waffles. What sets this waffle maker from other waffle makers in the stores and the two we discussed here is the inclusion of the “Waffle IQ Technology” feature. Waffle IQ Technology is a proprietary feature by Breville and is an intelligent program that constantly tracks the temperature of the waffle plates and adjusts the cooking time accordingly for every batch of waffles. This feature makes using the Breville The Smart 4-Slice Waffle Maker incredibly easy to use. There is also a moat around the edge of the waffle maker to collect excess waffle mix and other spills. 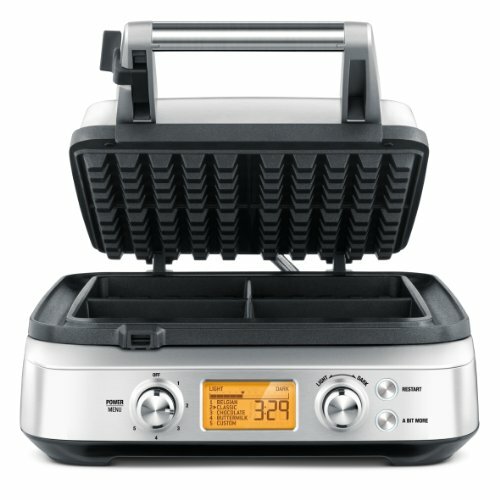 The Breville The Smart 4-Slice Waffle Maker has 5/5 stars based on over 130 customer reviews. Which Waffle Maker Should You Buy? We won’t recommend you splurge your hard earned cash on single-use appliances like waffle makers if you’re not going to use it often. If you’re just beginning and want to make great waffles for yourself and your family, we suggest you get the Cuisinart 4-Slice Belgian Waffle Maker. The Cuisinart offers great value for the price and has all the bells and whistles of a good waffle maker. On the other hand, if you’re a waffle enthusiast, and you’re willing to spend more for a product that will make perfect waffles for a lifetime, get yourself, the Breville The Smart 4-Slice Waffle Maker.